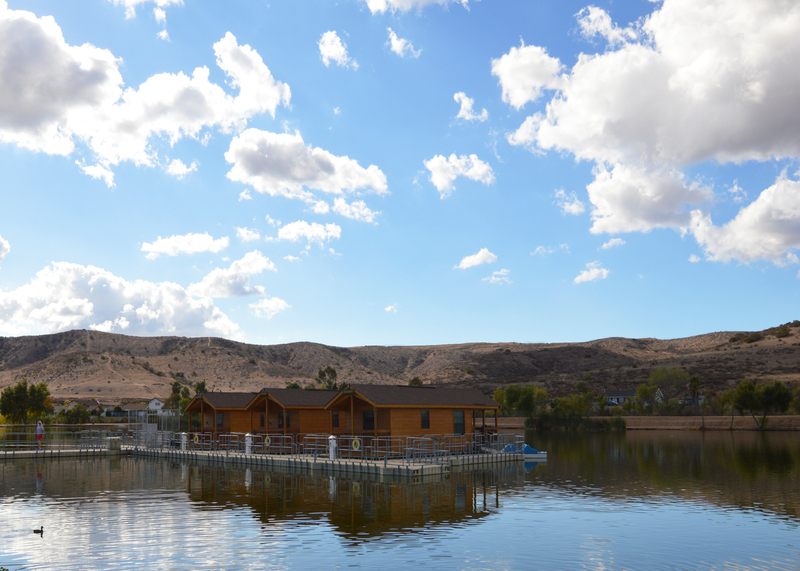 We had heard about Santee Lakes in a recent article about their new floating cabins so we had to see for ourselves as a possible new California staycation. 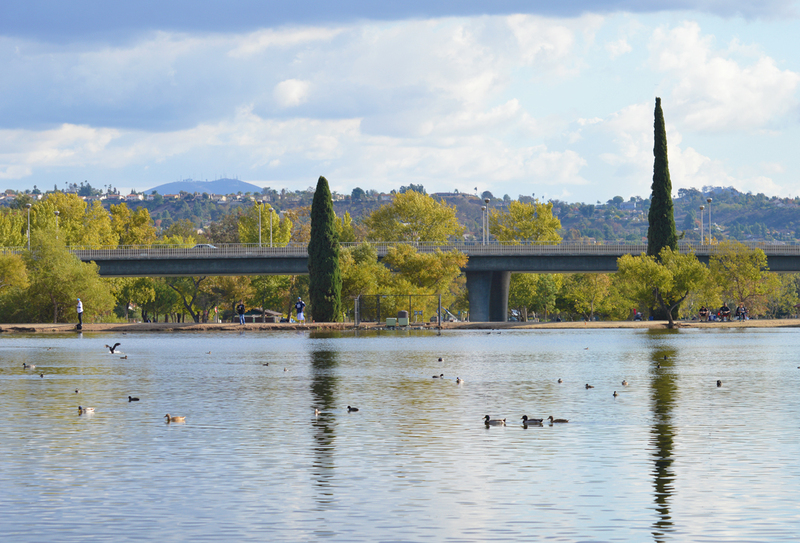 I was very impressed with Santee Lakes and the surrounding park like area. When we first drove by one small lake, I thought to myself, “That can’t be it? Where are the cabins?” So we pulled up to the entrance and were informed that there were actually seven individual lakes and the floating cabins were on the seventh lake. You had to pay $5.00 to get into the facility for the day and to view all the lakes, so we gladly paid the fee and proceeded on to explore the area. 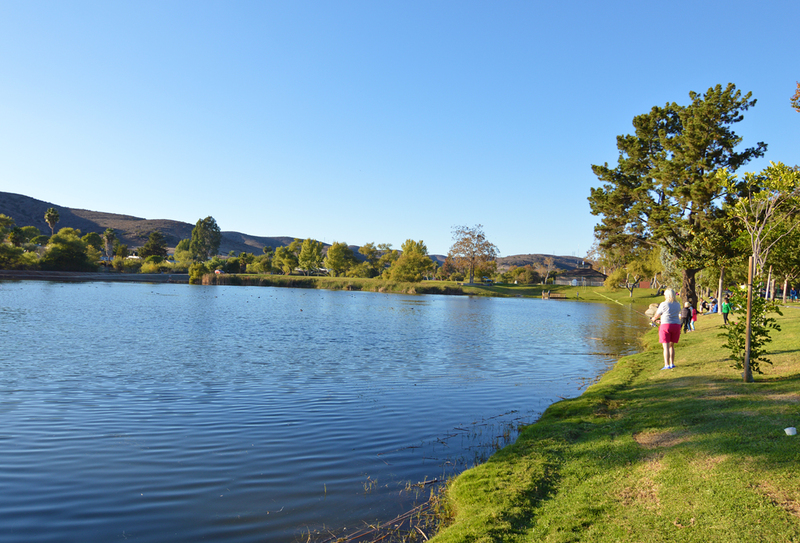 The seven scenic lakes are stocked with fish year round and not surprisingly there were plenty of poles lining the shore. With amazement we saw a few anglers that were finished for the day with a few sizable fish on their string. Fishing there requires no state license but you must acquire a permit at the general store which cost $8.00 for the day. Don’t feel like fishing? No problem, there is plenty more to do. There are 6 playgrounds for kids, a boulder island adventure course, pedal boat , canoe, or rowboat rentals, bike and surrey rentals, or hike along the trails aligning the lakes. 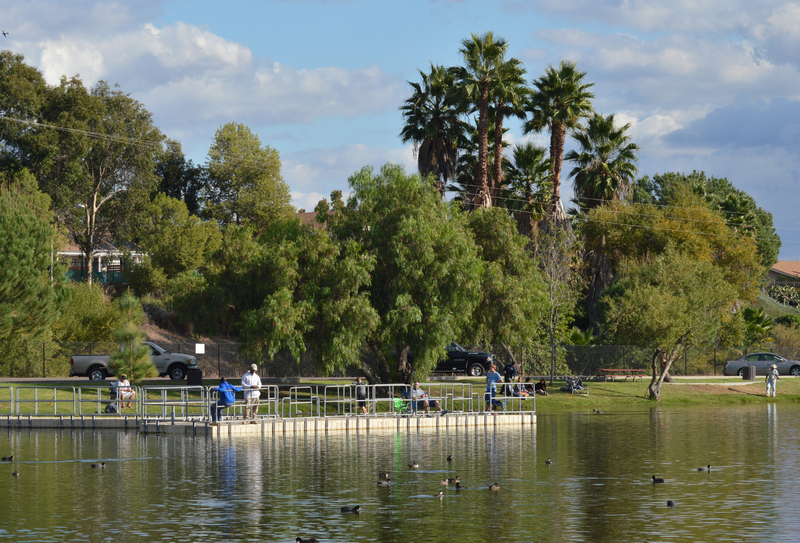 For bird watchers Santee Lakes is home to over 170 different species of birds, so bring your cameras and binoculars. 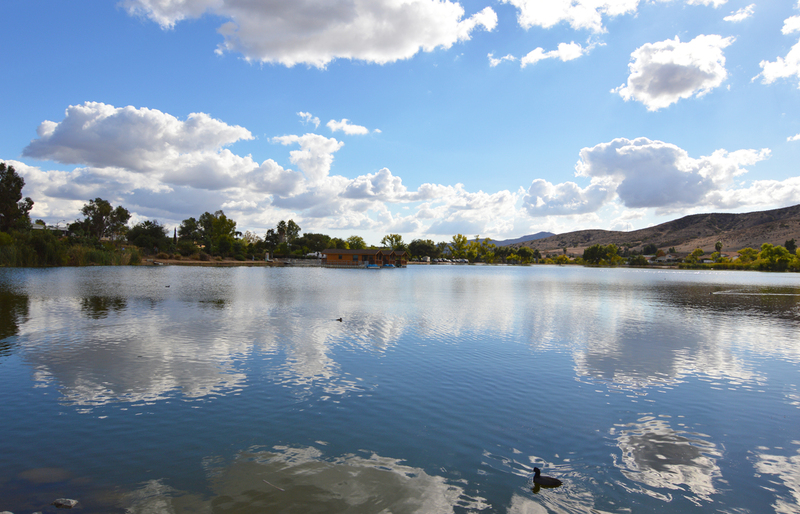 Santee Lakes is located in the east county just outside of San Diego, in the city of Santee. 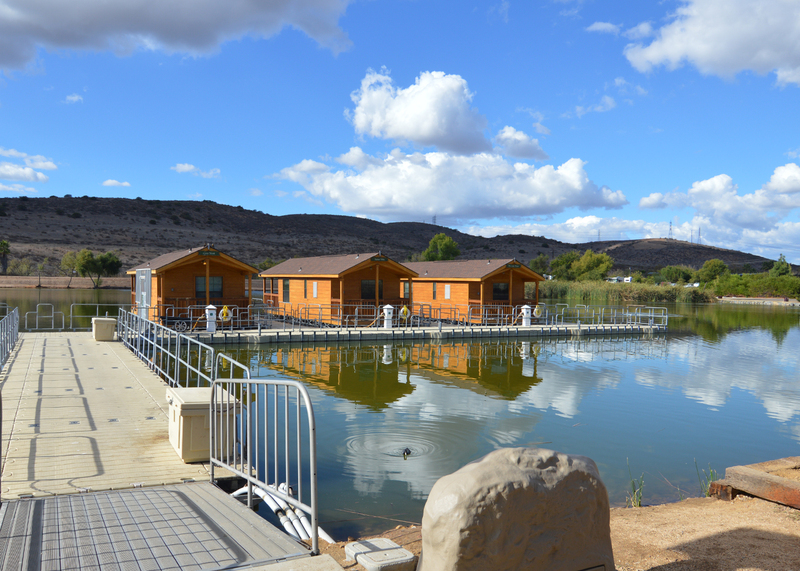 Along with the 190 acres of park and lakes, there is also a 300 site campground accommodating RV’s with full hook ups. A clubhouse sits nearby with two swimming pools(one heated) and a Jacuzzi. The pools are perfect as there is no swimming allowed in any of the lakes. The park opens at 6:00am Friday through Sunday. It hosts a variety of events throughout the year including summer movies, trout openers, 5k’s, etc. Food and drinks are sold at the general store and restrooms are always nearby. Dogs on leashes are also welcome. So on to what we were most interested about, the floating cabins. Resembling houseboats, the cabins sit on a private dock floating just offshore. 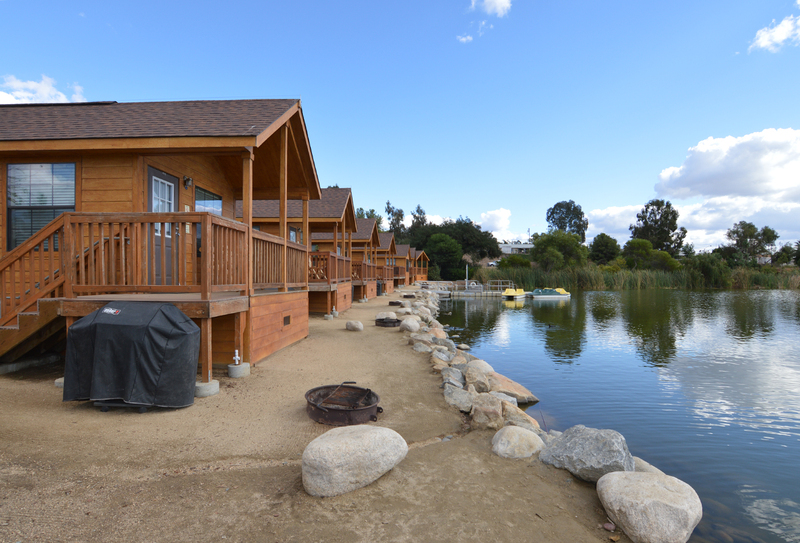 There are three cabins and each can be rented for $100-$145 a night depending on the date. Occupancy begins on April 1st., so check them out early of you are interested. We were thinking of getting a group of people so we could take over the whole dock. I can imagine myself watching the sunset from my floating patio with a cocktail in one hand and a fishing pole in the other. 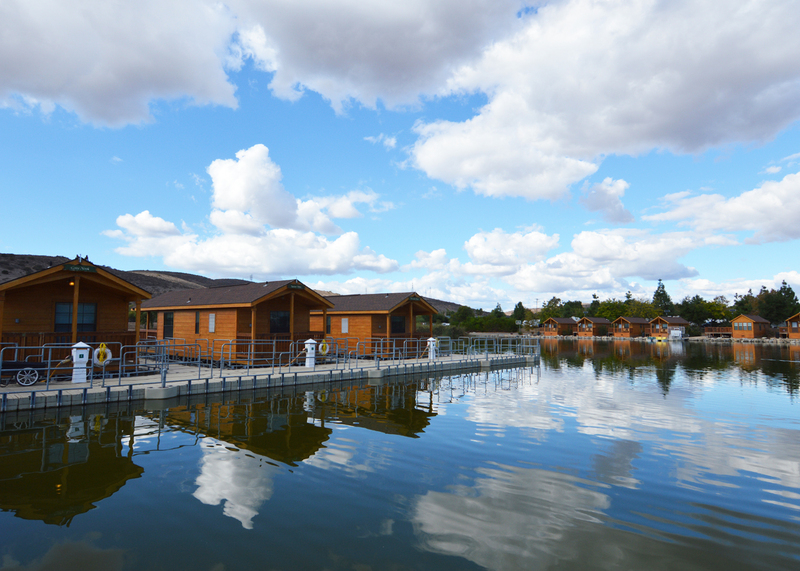 Each of the floating cabins sleeps four. 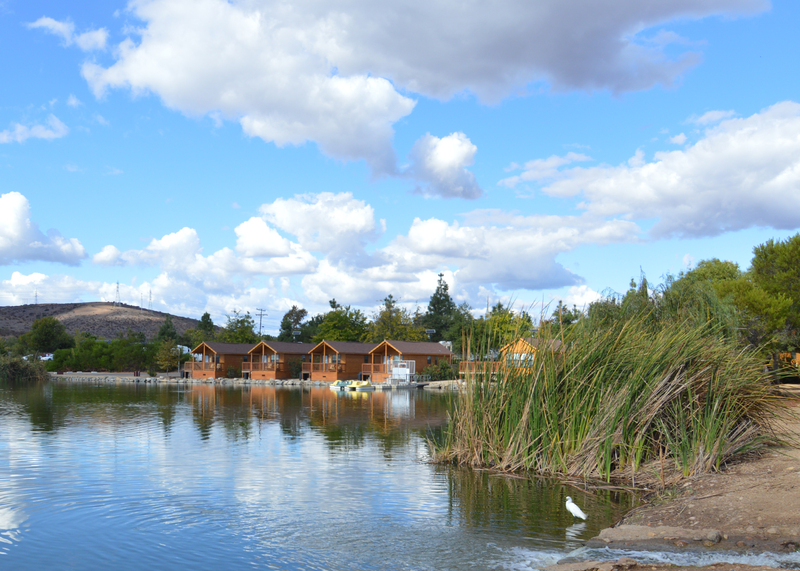 There are also 7 cabins on the shore and each cabin includes shared pedal boats for exploring the lake. Adirondack chairs line the porches and there are also barbecue and fire pits. We peaked inside one of the waterfront cabins and it wasn’t extravagant but cozy enough. Not really roughing it when you have air conditioning, two flat screen TV’s, and a DVD player. The kitchens are stocked with cooking utensils but you bring your own linen, toiletries, firewood, etc. The waterfront cabins sleep 6 if you include the bunk beds. Seems like a great weekend getaway to me with a relaxed and serene setting. Not too far from the city, you still feel like you are getting away. It’s a place you can watch the stars, hear the silence, and just relax.